One of the most important and fun days of your Disney Cruise is embarkation day, when you board the ship and kick off your adventure. Follow these tips to make sure you start your cruise off right. DO check in online. You can check in online at least four days prior to your sail date, which will save you time when you arrive on embarkation day. At the same time, you can register your kids for the youth clubs, reserve spa treatments, book shore excursions, and sign up for special activities, events, and dining experiences. If you don't complete everything in one session, you can save your information and come back later to finish. DO choose an early arrival time. Disney will ask you to select a port arrival time and give you an opportunity to schedule your transportation to the pier. Your cruise documents may say that the ship leaves at 4 pm, but check-in typically begins at 11 am and embarkation begins around noon. Choosing an early arrival time means you can start your vacation several hours before the ship sets sail, thus getting more fun for your money. DO consider which dinner seating is best for your family. Disney's rotational dining system offers two dinner seatings, at 5:45 pm and 8:15 pm. Many families with young kids opt for the early seating because it's closer to their regular dinner time. Yet the later seating allows you to see the shows first, and then enjoy a quieter dinner. Another plus: Parents can check their kids in for evening youth activities without leaving the dinner table. Counselors magically appear partway through the second seating to whisk the kids away to the clubs while adults finish dinner. DO schedule a surprise call from a Disney friend. Before your cruise, you can visit the Disney Cruise Line website to arrange a call to your child from Mickey, Goofy, or Mickey and Minnie together. Go to the "My Disney Cruise" tab, then click "My Reservations." Sign into your Disney account and your sailing party itinerary will appear, along with a dedicated box for Character Calls. Click "Schedule a Free Call' to set up a surprise call for your kids before your cruise. DON'T fly in the same day of your cruise. If getting from your home to the port in the same day means waking up at the crack of dawn to catch an early flight, you will be wiped out before the ship even sets sail that afternoon. That's not how you want to spend your first day on the ship. To get your money's worth on your cruise, it's better to fly in the night before so you're fresh and energetic and able to enjoy your first day of vacation. If you're flying into Orlando International Airport before a cruise out of Port Canaveral, Florida, consider staying at the Hyatt Regency Orlando International Airport. DO attach Disney Cruise luggage tags to your bags. Be sure to fill out the identifying information, including your stateroom number. DO have small bills handy. When you get to the port, you'll hand off your luggage to the porters. (It’s customary to tip $1 to $2 per bag). The next time you'll see your luggage will be in your stateroom later that afternoon. DO download the Navigator app. 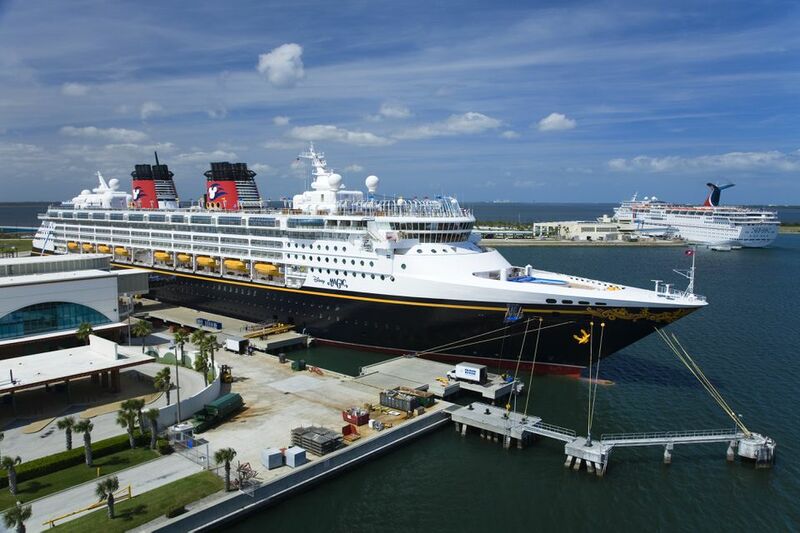 Before you get on the ship, download Disney Cruise Line's free app and turn on airplane mode on your smartphone. Set your wi-fi to DCL_Guest and you're good to go. The app will give you access to the ship's entertainment and event schedules, deckplans, kids' club activities, and dining menus, plus there's even a chat mode that lets you text your family members—all without racking up data charges. DO think through the security checkpoint. When you enter the port terminal, you'll pass through a security checkpoint with a metal detector similar to what you find at an airport. It'll speed up the process if you have placed your jewelry, belts, coins, and other metallic items in your carry-on bag. DO have your cruise documents ready. Inside the terminal, you’ll line up to finish checking in and get your stateroom key cards. You'll need your cruise documents, passports and a credit card handy. This is also when your kids will get special wristbands for the children's clubs. DO enjoy lunch. Once you've boarded the ship on embarkation day, you can either head to the top deck for a buffet lunch at Cabanas (Magic, Dream, Fantasy) or Beach Blanket Buffet (Wonder) or you can have lunch in the ship's main dining room that is open for lunch: Carioca's (Magic), Parrot Cay (Wonder), or Enchanted Garden (Dream, Fantasy). Both lunch options include a copious buffet, but the dining room will be quieter and a server will bring you drinks, whereas it's completely self-service at the top-deck buffet. DO reserve special experiences. Once you've boarded the ship, you can reserve any experiences you may have missed during online check in, such as spa treatments, shore excursions, or dinner at the adults-only restaurants, Palo (every ship) or Remy (Dream, Fantasy). DO start having fun right away. Your stateroom may not be ready until early afternoon, and your luggage may not arrive until hours later, but you can begin exploring the ship and having fun as soon as you board. The pools and other activity hubs will be open. DO have your family ready for the muster drill. On the first day of the cruise, typically around 4 pm, all passengers must attend a 10-minute muster drill and learn what to do in case of emergency. Plan to be in your stateroom at least 15 minutes before the drill. You'll find directions to your drill station on the back of your stateroom door. Attendance is mandatory. DON'T miss the Sail Away Celebration Deck Party. Just before the ship leaves the pier, grab your camera and head up for a top-deck celebration that includes music, dancing, and all your favorite Disney characters decked out in their sailor uniforms. It's a fun way to officially start your cruise.